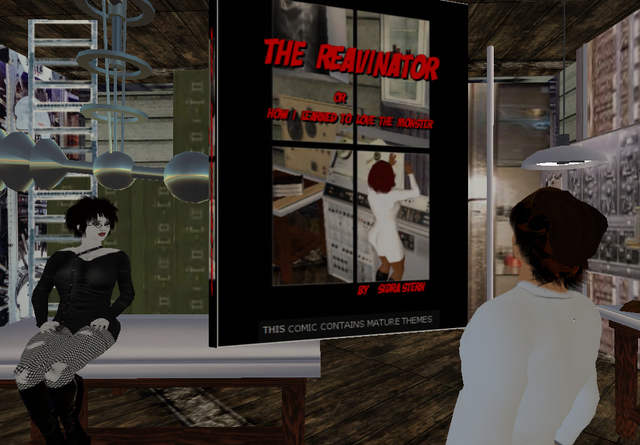 There's been SL comic strips, SL magazines, and SL advertisements that use graphic novel stylings, but unless I didn't get the memo (and that's always possible), there hasn't yet been much in the way of actual graphic novels using Second Life as an illustration platform. Enter Sidra Stern's "Reavinator", a witty (but not-worksafe) story of one madwoman scientist's quest to create Frankie, the perfect man. Sidra used a third party tool called Comic Book Creator to create templates and dialog balloons, incorporating those with screenshots featuring sets that she built and avatars in customized poses, to pantomime the action. "That's my favorite picture," she tells me, "the one with the phone." Ralek Queso created the animation so Residents would know you were in Busy mode, and Sidra retrofitted it for the comic. Another expression was created with Siggy Romulus' mood chooser heads-up display. Though she shares her name with the man-crazed heroine of her graphic novel, she says there's no autobiographical elements. "It's an archetype," she tells me, laughing. "I figured it would work well here, given the changes everyone can make to their avies and to their self." She's already working on the next issue. "It won't be with Frankie," she says. "That will come after the next one. I have to figure out what kind of trouble Frankie will get into." The use of "u" in the comic ultimately lowers its quality, and the fact that nothing I have read in it is funny leads me to believe that it isn't "witty". I'm not saying it isn't a good comic, but unless its purpose is to be a an action based comic, that's exactly what I'm saying. Also, the title is quite clearly a rip-off of Dr. Strangelove. I weep for you, Peter Sellers. The use of the "u" in the comic evokes the whole IM and online experience, and the frisson of logging on to a new virtual world. The title is clearly a humorous riff on Lovecraft's the Reanimator. If you know the definition of "archetype" then this comic is for you. And not least of all: Sidra is SO hot! omg. Funny movies, priceless pictures, site reviews, security tips and recommended software against spyware. In these blog there are so many things which is possible for graphic content several things can be possible it can be use for so many things which is great to know about it. In all these graphic content there are several things which is great and also very awesome these all are one of the best to use it can be performed great to know about it. In these blog there are so many graphic content which is very interesting and cool to know about it. In all these graphics are looks great.